Find More Low Fares! Experience Orbitz! ANJIANGKOU, China — The booming cities of northern China are parched and constrained by a growing shortage of water. Yet in China's rainy south, the mighty Yangtze River pours vast volumes, unused, into the sea. So why not, Chinese leaders have long asked, cross the country with new canals, bringing that "wasted" water to where it is vitally needed for the country's progress? In a world short of fresh water, one of the gravest challenges facing governments is that needs and supplies are often far apart. Now China, with water scarcity reaching the critical stage in sprawling showcase cities like Beijing and Tianjin, has embarked on one of history's great water-moving projects. At huge cost and great risk to the environment, the government plans to rechannel vast rivers of water from the Yangtze basin to the thirsty north, over three pathways of nearly 1,000 miles each. The official price tag of $58 billion, nearly half to be spent in the next eight years, is more than twice that of the Three Gorges Dam, China's most recent mega-project now nearing completion. Some officials speak of delivering new waters to a "green Beijing" in time for the 2008 Olympics, an indication of the political overtones of the project as well as the crash timetable. "We have to sacrifice so that people in Beijing can drink water," said Zhang Jize, a 32-year-old farmer and father of two daughters who is among 370,000 people the plan will uproot. Such immense, centrally planned projects have been tried before, notably in Central Asia, where a Soviet-era plan has steadily drained the Aral Sea, turning what was one of the world's largest inland bodies of water into a salty desert and providing a vivid illustration of the dangers of bending nature to economic needs. But China, convinced of its future as a great power, believes the project is essential. Some have drawn parallels to the great water works of the United States, like the the Tennessee Valley Authority that spurred rural development beginning in the 1930's or, more appropriately, the canals that took northern waters to fuel fantastic growth in arid Southern California. But the Chinese project is on an even grander scale. Like China's construction of the Three Gorges Dam, which set off global debate, this latest venture raises a host of tough questions, including how to deliver clean water across one of the world's most polluted landscapes. Perhaps toughest of all, in a country where no good patch of land lies idle, is how to provide for those like Mr. Zhang and his family who will be moved. For Mr. Zhang and many others who live around the Danjiangkou Reservoir — a linchpin of the new project — it is not the first time they are being displaced, and their travails parallel China's expanding ambition to meet its water needs. Some 30 years back, when Mr. Zhang was a toddler and the dam was first completed, he and his parents were sent from their fertile valley plot to a remote spot on the banks of the new lake, receiving little compensation for their troubles. "Life is too hard here," he recently told a visitor, gathering with his family in their house with walls of wood and packed earth, covered with old calendars and newspapers. As the government makes its plans for a new mass move, bitterness survives from those earlier rounds of resettlements. Party leaders know that the issue could be explosive if not handled with more care than during past projects, including the Three Gorges Dam project, which will eventually displace more than a million people. Chinese officials have often glossed over the challenges in public, and most planning has taken place entirely behind closed doors. But they and their scientists are working feverishly on a host of issues as construction of two routes is expected to begin in the coming year. Northern cities have begun to raise water prices for consumers and reduce waste, vital steps if the project is to provide lasting solutions. Provinces, meanwhile, are already fighting over how the water will be shared, because some of the delivered waters will require expensive cleansing. "If we're given smelly water and Beijing receives all the clean water, it will be bad for our image and our living standards," said a city engineer in Tianjin, a teeming city of 10 million that desperately needs new water but fears the expense. The demand has become urgent throughout the densely populated north-central plains, home to metropolises like Tianjin and Beijing, with a population of 13 million, as well as dozens of smaller cities that are bursting with people and construction. Over-pumping of groundwater in the region has forced people to probe deeper for wells every year, and in some areas has caused disastrous sinking of land. Urban consumers take scarce water from farmers, while planners warn of smothering new restrictions on industry. Much of China's arid northwest, at the same time, is turning into a dust bowl, its land destroyed by drought and overuse and its residents caught in desperate poverty. Each of the three routes envisioned to bring water to these thirsty areas has its own challenges. Of these, the western route is most tentative, with construction scheduled to start in 2010. It would channel water from upper tributaries of the Yangtze to China's arid, needy northwest. But as it takes water from Tibetan regions it may stir political controversy, and it poses severe engineering challenges and awesome costs. The current estimates are $36 billion for this spur alone. The eastern, coastal route is technically simple, though it will require 13 pumping stations, which will consume large amounts of electricity to lift water from near the mouth of the Yangtze to the higher north. It will save costs by following much of the same path as the ancient Grand Canal — second only to the Great Wall as a wonder of Imperial China — that once moved silk and rice from the south to Beijing. The main challenge is pollution. The route cuts across many of the world's most soiled river basins. Along the hundreds of miles of the canal that is still in use, it bustles with barges carrying sand, coal and other goods. Its shores are lined with primitive houseboats, home to hundreds of thousands of people who rely on the canal for work and waste disposal as well as living space. The waterway also receives untreated sewage from hundreds of nearby towns and villages and the effluence of thousands of factories. At huge cost — $58 billion — China plans to rechannel water from the Yangtze basin to the north. 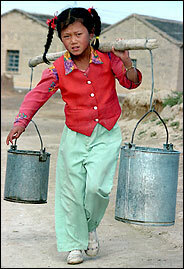 Zhou Ying carries water after school each day in northwest China. You can now track properties that interest you, with our Real Estate Tracker. Click here to sign up for the e-mail and start receiving information on the latest properties on the market.